I had a handful of watercress left over from the watercress soup, and I found a recipe for a sauce of watercress, garlic, red pepper flakes,tomato, olive oil, white wine and pancetta (optional for vegetarian) to serve with potato gnocchi. It turned out so good that I forgot to put the bacon (I had some on hand and substituted it for the pancetta) in it until I'd eaten half of it! I also didn't add any Parmesan, but forgoing the Parmesan meant that it required a little more salt. I used tomatoes from my friend's garden that I froze back in August. The recipe calls for store bought gnocchi. I'm sure that works well if you are in a hurry, but I figured I should do something productive on a Sunday afternoon besides napping. 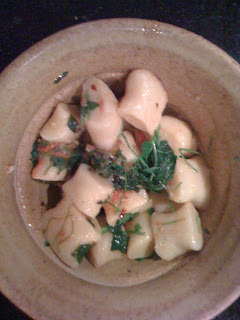 I made the gnocchi with some potatoes in my cupboard that were beginning to sprout so they had to be used. I found a totally easy recipe in Cooks' Illustrated. Heat oven to 400 degrees. Bake potatoes until a metal skewer slides easily through them, 45 minutes to 1 hour, depending on size. Hold potato with a pot holder or kitchen towel and peel it with a vegetable peeler or paring knife (see illustration 1); rice peeled potato into a large bowl. Peel and rice remaining potatoes. Cool until potatoes are no longer hot, about 15 minutes. Sprinkle 1 1/4 cups flour and 1 teaspoon salt over warm potatoes. Using your hands, work mixture into a soft, smooth dough. If dough is sticky (which is often the case), add more flour as needed, up to 1 1/2 cups total. 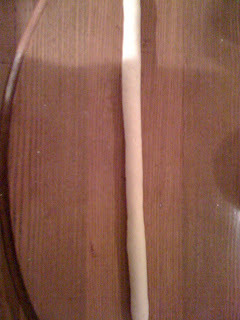 Roll about one-quarter of dough into a long 3/4-inch-thick rope. If rope won’t hold together, return it to bowl with remaining dough and work in more flour as needed. Repeat until all dough is rolled. Bring 4 quarts of water to low boil in large pot. Add 2 teaspoons salt or to taste. 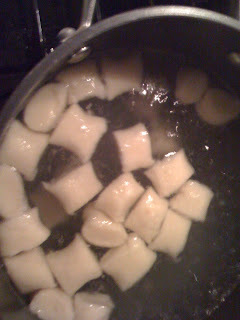 Add about one-third of the gnocchi and cook until they float, 1 1/2 to 2 minutes (about 3 minutes for frozen gnocchi). Retrieve gnocchi with slotted spoon and transfer to warm, shallow serving bowl or platter. 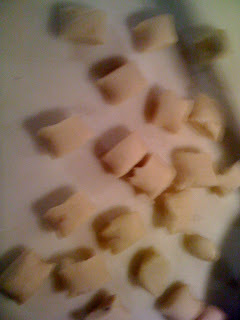 Repeat cooking process with remaining gnocchi; see related recipes for topping suggestions. I hope everyone had a lovely Thanksgiving. I'm very underwhelmed by turkey. Next year I will try a turducken largely because I'd rather eat duck or chicken over turkey any day including Thanksgiving Day. Side dishes are the best part of Thanksgiving. Someone gave me some sweet potatoes from a farm in Johnston County, but I ended up not using them until the weekend. I wanted to do something besides the usual sweet potato with marshmellow (yuck) or praline (yum) topping. One thing I remembered about visiting Australia years ago was that the Aussies seem to combine sweet potato and goat cheese fairly often. Since these are two of my favorite ingredients, I searched for a recipe and found this one from Epicurious.com which also features truffle oil. How could it possibly not taste good? It turned out very well indeed. The tartness of the goat cheese complimented the sweetness of the potatoes and also made them very creamy. Truffle oil is truly a wonder. I put it on just about everything I can think of including frozen pizza and mashed white potatoes as well as pasta. It's outrageously expensive but it lasts a while since only a few drops are necessary for a nice truffly flavor.